Herrington Harbour’s Osprey families had a very successful breeding season with four new males sitting out the day on the piles. They will soon begin their migration and will be missed for their chirping as we pass by. They are incredibly graceful and I have been photographing them for years. This family seems to be doing quite well! 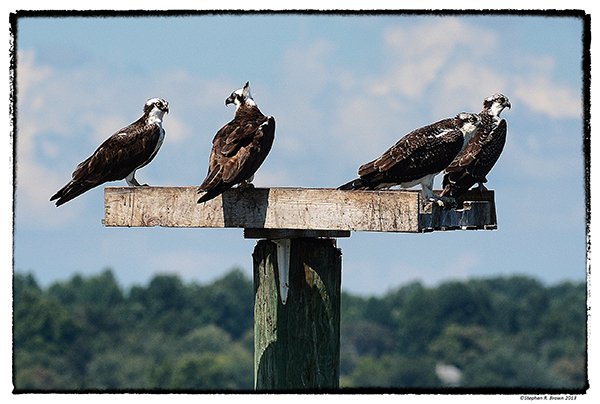 A couple of decades ago, they were almost extinct but today, our Ospreys occupy every upright piece of timber in the Chesapeake Bay area. 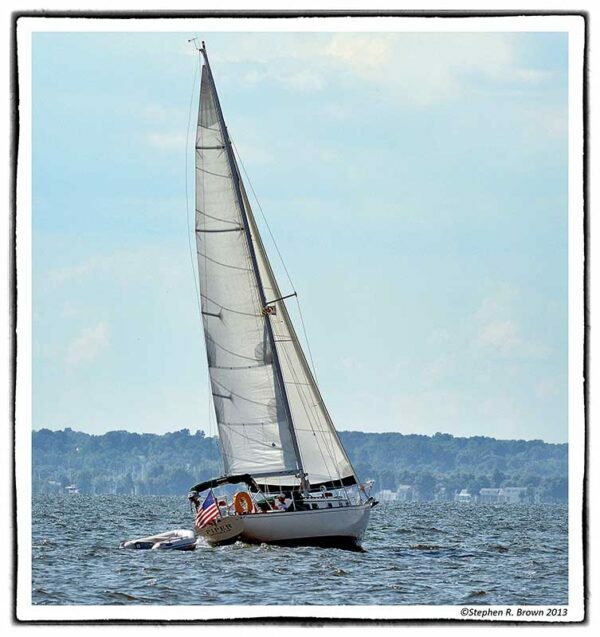 A Bristol 40 called Piper out of Galesville, Maryland is the larger version of our 32. 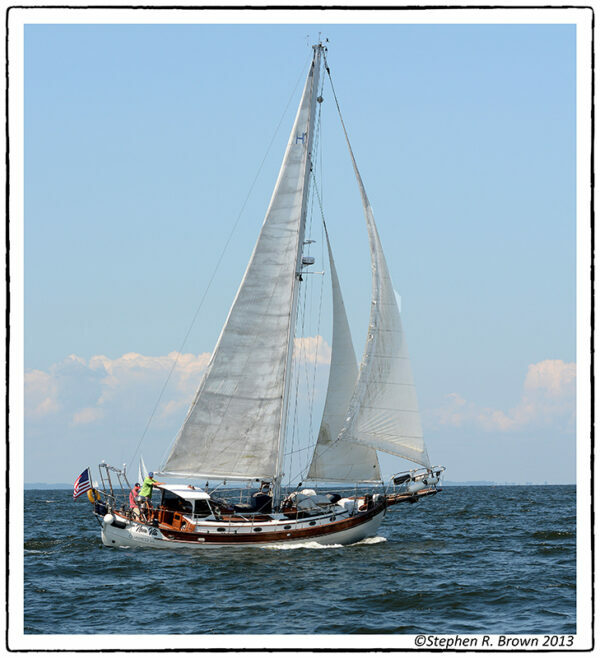 These two are great boats for the Chesapeake Bay as they sail equally well in both light and heavy air. I do suspect however that everyone who ever designed or built a Bristol must have been 5’4″ and 120 pounds as they are the among the very narrowest boats. 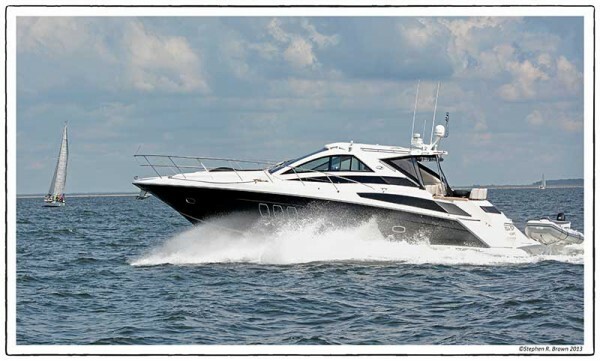 However, their graceful hull with the upswept transom and great tracking ability in heavy weather makes up for any lack of comfort with a reliable boat in all weather. This is “Nova Vita” out of Quantico, Virginia. Every time I see a classic boat like this I begin to tell myself a story. Lets see…this one is looking a bit beaten up with the sails looking musty but then the teak looks to be in good shape and the dinghy is out on deck showing recent use. It’s got the additional cabin setup and the stern is equipped for a wind vane autopilot. Distant Voyages? This boat looks like a Chinese made Panda or Baba. The winds were in the low twenties and just perfect for this ketch rig which requires a good wind. We rented a Baba 40 for a Bay assignment because it was beautiful for photography but we did a lot more motoring than sailing. This futuristic looking yacht was up on plane in moments. He’s obviously keeping his bottom clean…always a good idea when you are trying to achieve speed and gas mileage. “L’Escargot” has been in the water for six months and the bottom wasn’t so clean and sailing has been at best leisurely. So I had the opportunity to spend some time with Emily Manders yesterday evening. She is a mom, science teacher, sailboat racer and diver who restored the Bristol to its normal six knot motoring speed, One of the nice parts of the Summer schedule is catching up with Emily on Bay news as we motor out to a quiet spot just outside the Marina where she can work safely. 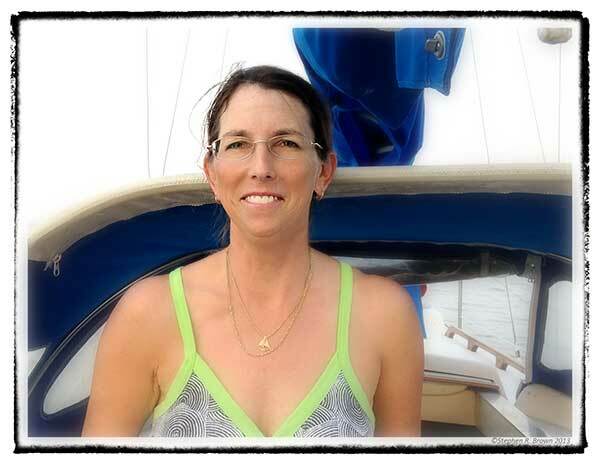 She home-schooled her kids, teaches science in the special education field and is an avid sailboat racer. Her fondness for the Bay is deep and it’s a pleasure to share that affinity. August 28, 2013 | Filed under About the Book, Blogs, Books, Photography, Tidewater and tagged with Chesapeake, Chesapeake Bay, Current Affairs, Environment, Estuary, family, fishing, John Smith Trail, National Park, National Park Service, Travel.